We have made every effort to display the colours, specifications and dimensions of items on the website as accurately as possible. The colours you see will depend on the resolution of your monitor, we cannot guarantee that your monitor's display of any colour will reflect accurately the colour of the item delivered. We may from time to time vary the dimensions, specifications and quantities of items displayed on our website without prior notice. For example, the bouquets are subject to seasonal availability of gourmet. Deliveries are made 7 days a week, 365 days a year, we accept same-day deliveries up until 7pm, please contact us on Call Us (UAE): (04) 224 8800 if dialing domestically, or +971 -4 -224-8800 if dialing internationally to place your order today! *Certain products qualify for free shipping. If same day, delivery charge is AED 0.00 for timeslot 6PM to 9PM. We do not accept multiple booking or orders. (Website) will NOT deal or provide any services or products to any of OFAC sanctions countries in accordance with the law of UAE. Change of delivery date for perishables must be received 24 hours in advance. Any change requests received with less than a 24 hour notice will result in a 50% charge on gourmet and 100% charge on edible products such as chocolate, cake, dates, fruit, etc. 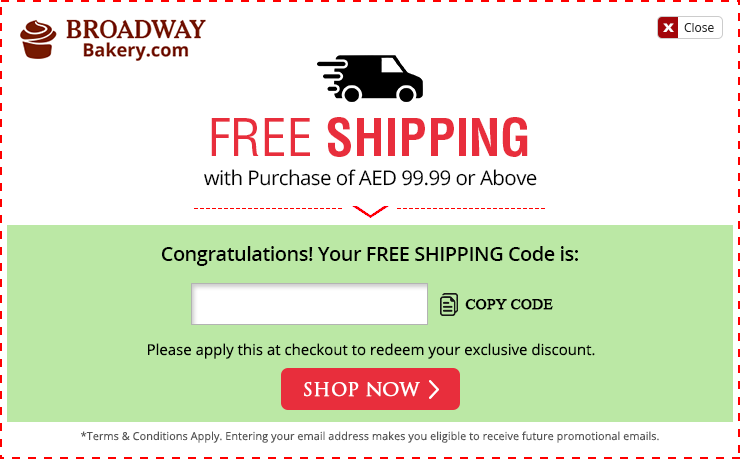 Discount Codes - Offers are only available through broadwaybakery.com and can be redeemed by entering or calling in with the promotion code you receive in your email. Offer is only applicable for domestic deliveries within the UAE and is subject to availability, delivery rules and times. Additional surcharges may apply. Offers cannot be combined, are not available on all products and are subject to restrictions and limitations. Order must be placed prior to the expiration date provided for the discount code. Rewards and Complimentary Points - Orders that are placed will lead to rewards points being earned for your purchases. These points can be redeemed later towards future orders. You can access these rewards online or by calling in. Points are only valid for domestic deliveries within the UAE. They are subject to availability, delivery rules and times. Points cannot be combined with any other promotion or offer. Order must be placed prior to the expiration date provided for the Rewards or Complimentary Points. Rewards earned by posting a review on Google+ are automatically added to your account. A customer can only earn a maximum of 1,000 rewards points for posting review(s) on Google+. This applies for returning customers and multiple orders placed by the same customer.These points can be redeemed later towards future orders. You can access these rewards online or by calling in. Points are only valid for domestic deliveries within the UAE. They are subject to availability, delivery rules and times. Points cannot be combined with any other promotion or offer. Order must be placed prior to the expiration date listed for the Rewards Points. Offers are only available through Flowershop.ae and can be redeemed by entering or calling in with the promotion code. Offer is only available when you purchase any floral arrangement for domestic deliveries within the UAE. Code is also valid for store purchases/pickups of flowers with a value of AED 199 and above. Promotion is subject to availability, delivery rules and times. Additional surcharges may apply. Offers cannot be combined, are not available on all products and are subject to restrictions and limitations. Order must be placed prior to the expiration date provided for the discount code.